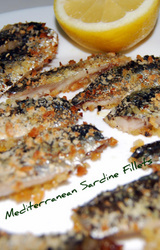 Everyone loves sardines, whether they be grilled on the beach or filleted as in this sardine recipe. The tinned ones are great because you can eat everything and don't have to worry about bones, scales etc. But we've found, over the years that the beach grilled type are generally too bony, with too many guts left in and too much salt added. So you end up with a delicious mouthful of salty bones with scales on. This is certainly the case where we live in Spain. 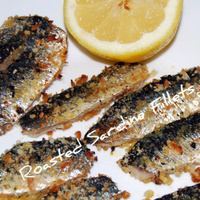 So this is a sardine recipe with none of the above - just fillets of fresh fish - simply rolled in seasoned fresh breadcrumbs and quickly roasted in the oven. Add fresh lemon juice and nothing else. Delicious and incredibly good for you too. About 600g. 1-1/2lb. of fresh sardines. 50g./2ozs. of fresh white breadcrumbs. A large whole lemon - cut in half. In a sink with plenty of cold running water descale the sardines. You can do this by running the back of a knife upwards from tail to head. Try doing it under the water to avoid scales flying all over the kitchen. Now gut the fish and wash out the cavities. Fillet the fish by cutting down to the backbone just behind the head and sliding your sharp knife along the backbone towards the tail. Then turn the fish over and repeat on the other side. Grease an oven tray with some olive oil and lay a half the breadcrumbs across the bottom. Sprinkle half the garlic and some salt and pepper on top. Lay down your sardine fillets skin side up. Now cover with the rest of the garlic and another sprinkle of salt and pepper. Top with the remaining breadcrumbs and a sprinkle of olive oil. Bake in a preheated oven at 400ºf./200ºc. for about 8-10 minutes. Serve with half a lemon each and a crisp salad.